Well it finally stopped raining for the time being. There may be a few showers this afternoon so I took the opportunity this morning to pull a few weeds, another gift from the rain. Then I started to get into that dream state where I do a little more and then a little more. I'm sure you gardeners know what I'm talking about. Before you know it, you've done a whole lot of things outside but possibly not what you set out to do. Anyway, while deadheading the roses and geraniums I finally noticed it - mosquitoes were swarming all over me! So I ran back inside. They always seem to win the battle. Moving on, I thought I'd talk about this lovely little rosebud. It's called 'Janet' and it's a David Austin English rose. It's even prettier when in full bloom, with peachy-pink cupped blooms and a nice tea fragrance. And it seems to resist blackspot pretty well. So those are all the great things about it. However, it's got one really annoying habit that I can't for the life of me figure out. When it blooms, it hangs its head down so you can't see the blooms! I planted it last year, it grew and bloomed vigorously but always planted its face in the dirt. So I pulled it out early this spring, planted it in a big pot, and put the pot on a concrete wall. I thought at least I would be able to see the blooms at face height. And that is indeed the case but they still turn upside-down. I guess it's the weight of the bloom that does that and perhaps the canes are not sturdy enough. I thought putting it in a pot would toughen it up to the point where it could face the sun, but no. So I'm wondering - am I the only one with this problem and if not, why would a rose breeder release a breed that blooms upside-down?? So great to have a Scottish gardener/blogger on my blog! I remember envying how wonderful the roses looked in Scotland when I was there. I love the mirrors on the ground idea - that really made me laugh. The 'Janet' blooms are okay with me, now that I can see them better. But they were truly planting their faces in the dirt before I potted the plant up! Have a great gardening weekend yourself! :-) Yep, big hair and big blooms have a challenge in this state! My friend Alexis Wreden designed the bones of my garden (I do the plant placements, good or bad). Alexis is an artist and a landscape architect and teaches at Louisiana Tech University. She's super talented! I'll send her your compliments, thanks! I have to say I know what you mean about Janet! 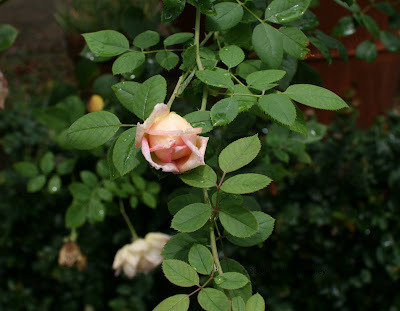 I bought 3 this year I read they were suppose to be like hybrid teas and it turned to be a climber like rose with the roses all pointing down. Im think that next year I will add some pillars so they can climb and the roses can face up. My husband stuck a stick in the ground on one and Janet really liked it, the roses looked much better this way. So I will have to add some pillars and see if that makes them better. But you are right they do resist blackspot quite well and the roses are beautiful. I also planted "Janet" last year and was disappointed. Not only did the bloosoms hang to the dirt they didn't open. The outer petals would dry out and the inner petals would rot. I have a lot of roses that doop a bit and it's charming but laying on the dirt is too much droop. Out she goes. Well I'm so glad to hear I'm not the only one with problems with Janet. I think she'll be a great candidate for a passalong plant.